I am very excited for this opportunity of going to Italy this summer. 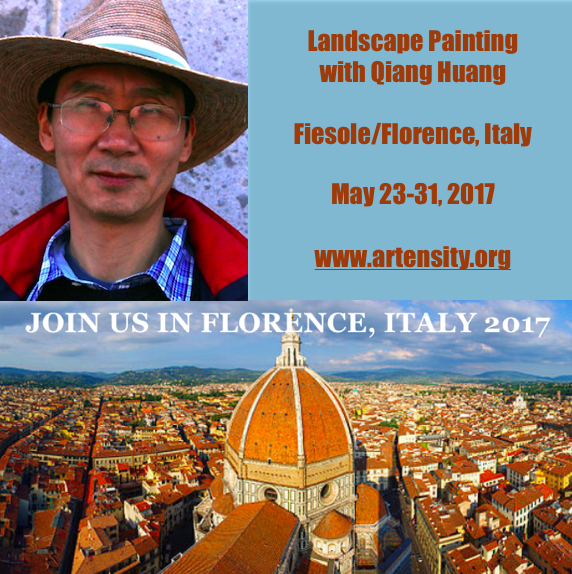 We have planed this wonderful trip to Fiesole and Florence from May 23 to May 31. This will be small group. I will share my plein air painting approach and provide specific guidance to help you to improve your art. Besides art classes, we will enjoy more other cultural activities as well. At this moment, we still have a few openings. Please visit: Landscape Painting in Italy with Qiang Huang for detailed information and signing up. Thank you. This is the second demo. What is that blue thingy to the left of silver pot? It does not really matter. I feel great and honored for teaching at the Scottsdale Artist School again. I have a relatively large class with 18 people from all over. I want to thank SAS and all the artists for coming and painting with me. It is my first demo. I got more and more abstract nowadays. I need to be careful not moving from loose to sloppy. Another plein air painting. I feel this one is not as good as the previous one, but I surely learned a lot. I have realized how much I don't know about painting natural subjects, such as bushes, rocks, waters and so on. I feel more comfortable with objects with regular forms, like apples and oranges, but most of objects I deal with theses week have irregular forms. Give me some time, I will get there. 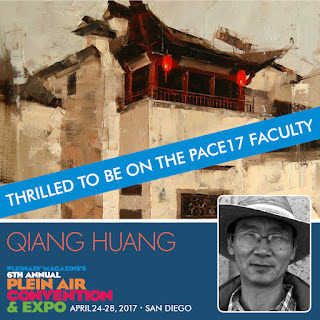 I'll be at the Plein Air Convention in April in San Diego. If you are thinking of going, make sure to book today and save $400 off the full price - the early bird price expires at midnight tonight (Feb 14). Get your tickets before #PACE17 sells out! Hope to see you there!! This is interesting. My mind is telling me: "You thought you know how to do it. Guess what, you don't." That is true. My today's painting didn't come out as I want it to be. In other word, I still do not have a control on my rose paintings yet. I am humbled even more. I will analyze what is going on. At least at this moment, I know, (maybe that is my advise to you as well): DO NOT listen the news when you paint. I will sell this painting cheap. Red rose is always difficult. So I don't paint this kind very often. It is hard to vary the value to make the red go brighter without losing its vibrancy. Even photographing the red rose painting is difficult. I have a feeling that the digital cameras do not show the variation of red well. I can't tell the difference among pink red, cadmium red, and orange red from the photo. The painting looks a way better than the photo. Observing my previous 5 rose studies, I have seen that the integrity of those flowers gradually fallen apart. I didn't know what has happened, and I didn't even know this is happening until I did this one. Many years have passed, and I did so many roses. However, I suddenly found that there is so much I still do not know in painting this relatively simple subject matter. It makes me humbled even more.